Looking for a rock climbing wall for your next big event? Our inflatable rock wall is a safer and cheaper alternative to most rock wall rentals offered in Houston. 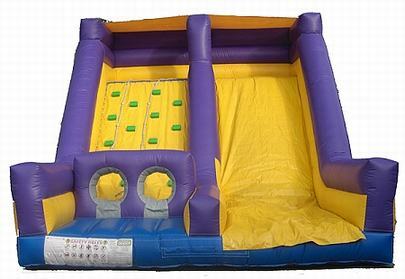 This rock wall also has a slide - combining the fun of an inflatable slide with the excitement and challenge of a rock wall. After going through a protective bumper tunnel, participants climb 15 feet up the inflated rock wall. The protective, inflatable bumper prevents participants from falling out, which makes this a reliable and safe rental for school and church events, as well as your next birthday party or promotional event. This rockwall moves traffic through your event extra fast and it looks great. Why pay over $1,000 for a dangerously complicated rock wall when you can get much more for less?